Third DDOT Crosstown Workshop Further Distills Transit Options, Provides Three Basic (but Flexible) Concepts for Review | Park View, D.C.
DDOT’s third Crosstown Multimodal Study workshop held on June 9th further refined east-west traffic ideas to two basic approaches — improvements that can be accomplished with no major construction and improvements that would require significant construction. 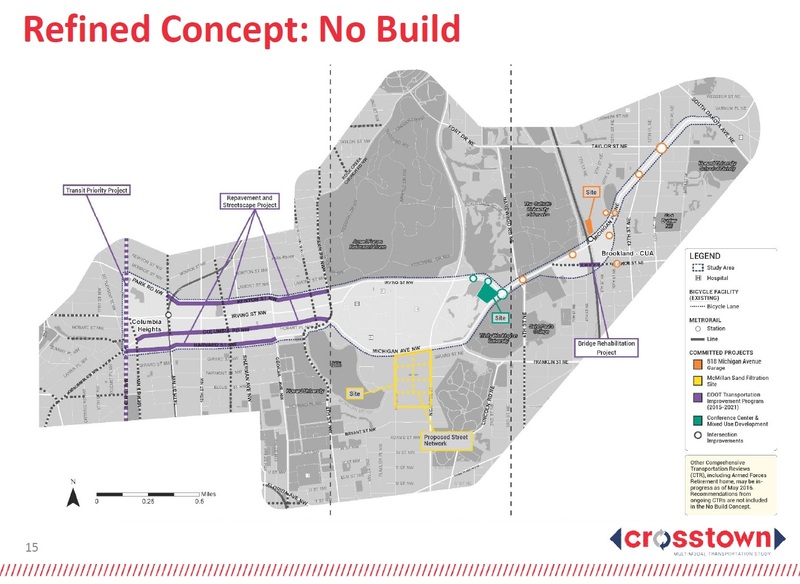 The No Build concept would use the existing street network and incorporate improvements from projects that are already committed. 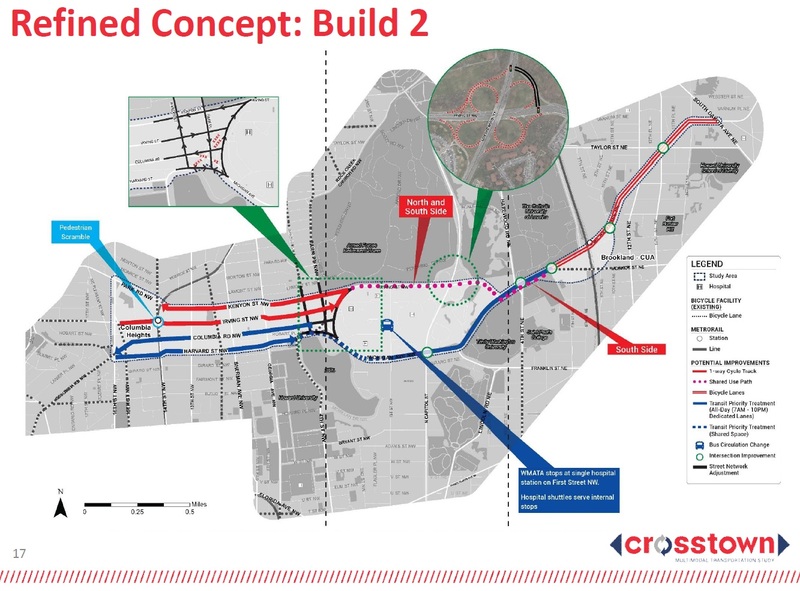 The Build concepts focused on the existing basic network structure and incorporate modal priorities on area streets as well as including improvements to the street grid and interchange areas. After reviewing the proposed concepts, residents had the opportunity to participate via a brief survey (online survey here). 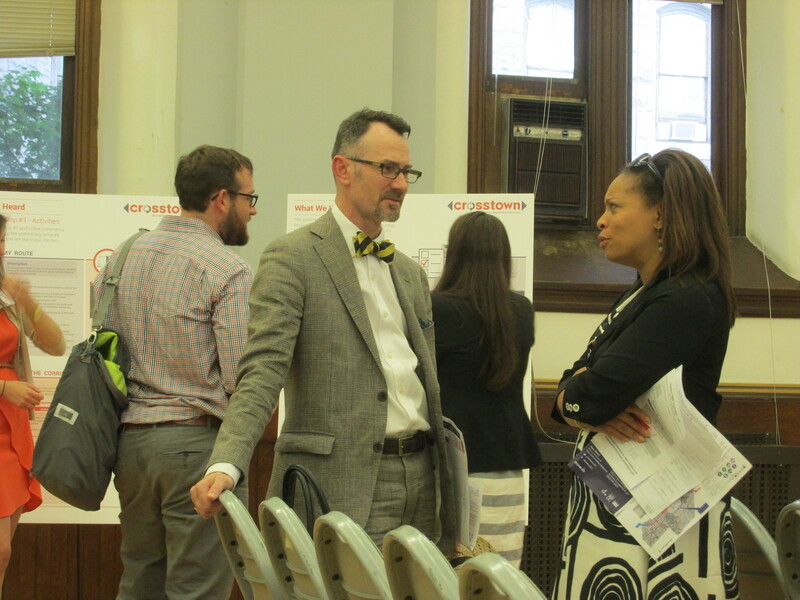 ANC 1A Commissioners Kent Boese and Rashida Brown discussing the options at the workshop. The two basic build concepts presented at the third workshop were distilled from public feedback during the first two workshops. 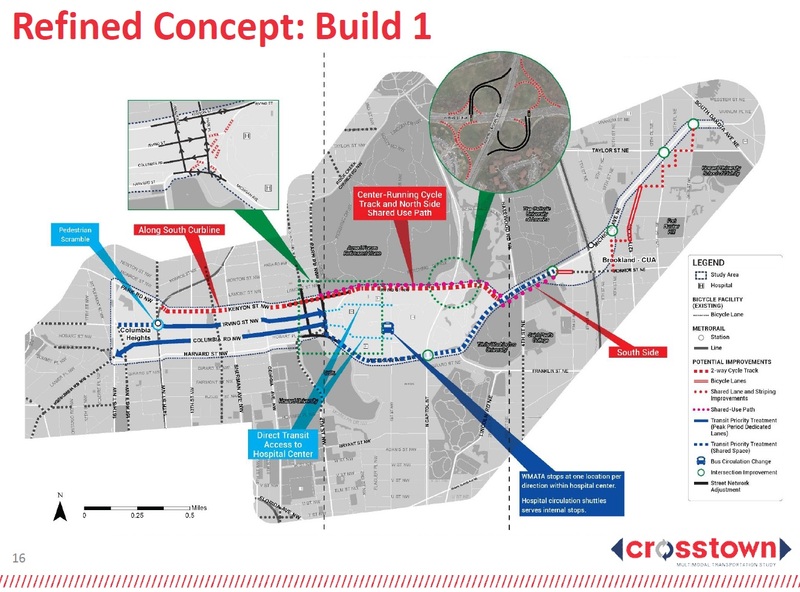 That feedback included requests that the concepts be presented in a less technical format and that more information be provided on the trade-offs of the potential cross-section proposing the road diet and bicycle lanes on Michigan Avenue, NE. In reviewing the information and engagement boards at the June workshop, the No Build concept is the least costly, but also the least desirable as it would result in modest improvements. It would consist of repaving Kenyon Street, Columbia Road, and Harvard Street and rehabilitating the Monroe Street bridge over the railroad tracks in Brookland. Additional improvements would be included due to the 818 Michigan Avenue garage, McMillan Sand Filtration Site, and the Conference Center development projects already in the pipeline (see map below). The two Build concepts were each based on an underlying structure which participants could review. Upon these structures, three focus areas were identified — the street grid west of the hospitals, transit access to the hospitals, and the North Capital Street interchange. The two Build concepts did a good job in identifying the trade-offs that would be required for improved crosstown transportation. Bike Improvements: A 2-way cycle track would be located on the south side of Kenyon Street and connect with a center-running cycle track and north side shared use path north of the hospital center. The path would connect to a shared-use path on Michigan Avenue as far as Monroe Street. From there, bike riders would zig-zag on surface streets with a combination of shared-use paths and bike lanes. Bus Improvements: Dedicated bus lanes would be created on eastbound Irving and westbound Columbia Road during peak hours. To the south of the hospital center and eastward to Monroe Street buses would share lanes with other traffic. Pedestrian Improvements: A pedestrian scramble is proposed at 14th and Irving streets by the Columbia Heights Metro Station along with intersection improvements at various points along Michigan Avenue. See the map below for the suggested changes to the street grid, bus access to the hospitals, and cloverleaf. Bike Improvements: 1-way cycle tracks would be installed on westbound Kenyon Street and eastbound Irving Street. These would connect to shared use paths on the north and south side of Irving to the north of the hospital and continue eastward on the south side of Michigan Avenue as far as Monroe Street. From there, bicycle lanes would be established on Michigan Avenue as far as South Dakota Avenue. Bus Improvements: Dedicated bus lanes would be created on eastbound Harvard and westbound Columbia Road as well as on Michigan Avenue from 1st Street NW to Monroe Street NE all-day (7 a.m. to 10 p.m.). Buses would share lanes from Park Place (west) to 1st Street (east). Overall, Concept 2 proposes the most significant opportunities to improve east-west bike and bus transit by creating dedicated lanes. However, this also would have the biggest trade-offs as these lanes would largely be at the expense of on-street parking. For those who had a strong preference for one of these two concepts, but didn’t like every detail, a workstation was available allowing participants to mix and match the underlying transit concept with the street grid, cloverleaf, and hospital access components from the two presented. Once again, residents and those who travel along this corridor are being asked to review the proposed options and provide feedback via an online survey. A fourth, and possibly final, public workshop is tentatively scheduled for September 2016. This entry was posted on June 14, 2016 at 7:01 am and is filed under DDOT, Sidewalk improvements, Streets and Trees, streetscape, traffic. You can subscribe via RSS 2.0 feed to this post's comments. Dedicated bus lanes should only happen if they are within the current street parking schedule. No street parking until 10pm on the rush hour lane would making parking in the study area that much more competitive. To me it looks like the idea of the dedicated bus lanes will disrupt the life of residents so that crosstown bus users are slightly less inconvenienced. The increase of residents in the area due to new development projects should be taken into consideration. Limit planning for parking will turn the area into a parking nightmare. Please don’t make any segment of Park Pl two-way!!! That’s what’s suggested in Build 1. What Park Pl needs is a two-way protected cycle track, not northbound car lanes, even South of Kenyon. I understand this study is not designed to improve North-South pedestrian/bicycle/car needs, which can be addressed later. It’s OK to defer that aspect of our neighborhood’s needs, but don’t set us up for much worse North/South-wise!